In the seven years that have passed since the city adopted its Downtown Master Plan, it has implemented a new parking strategy, added to the district’s housing stock and marked success in recruiting new businesses to the city’s core. Several large private and public development projects are either under construction or in the works, and Mountain Line has launched zero fare service, boosting ridership to record levels. Add it all up and city leaders believe downtown is moving in the right direction. McCarthy and Ellen Buchanan, director of the Missoula Redevelopment Agency, provided an annual update to the City Council this week on the progress made in implementing the downtown master plan. While several goals have been met – including completion of the 2009 parking plan – others remain in the works, such as the conversion of Front and Main streets to two-way traffic, upgraded traffic signals, and implementation of a city-wide broadband effort to connect businesses to high-speed service. But as the city grows and post-recession interest among investors returns, city leaders are also looking to write the next chapter, and they believe the time has come to update the master plan. With more than $200 million in development slated for the downtown district over the next few years, issues with parking, retail and housing may need fine tuning. 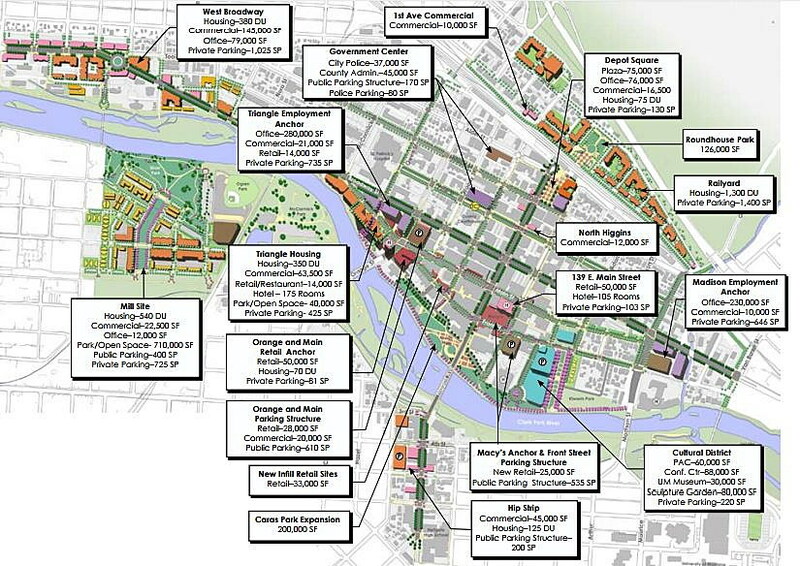 The original Downtown Master Plan was written in 2008 and released the following year under the purview of the Business Improvement District. The organization raised $450,000 to complete the plan, creating a strategy to help strengthen and develop the district. The plan envisioned commercial “hot spots,” complete streets, transit and parks. It called for 220,000 square feet of additional retail space, 280 new hotel rooms and 2,840 units of housing. The goals sought to transform the district into a thriving, vibrant hub, and backers see progress on nearly all fronts. Over the past year, 35 new businesses have opened downtown, with twice as many opening than have closed, McCarthy said. Across the district, several new housing projects are either under construction or slated for development, including condos and affordable housing in the Sawmill District and student housing on Front Street. McCarthy said the downtown district will continue to pursue several short-term goals, including the broadband effort, occupying the federal building, converting Front and Main, and completing a citywide wayfinding project. Improvements to the Caras Park corridor are being discusses, and city leaders are lobbying the University of Montana to consider placing a future Montana Museum of Art and Culture in the downtown district as opposed to the main campus. They’ve also announced plans to create a retail market analysis to help strengthen business recruitment. As startups mature at the MonTech business incubator on East Broadway, they hope to place them in the downtown district, helping bolster the city’s economic front. With the budgeting season approaching, downtown leaders have presented the City Council with a request to fund several downtown needs, including a second dedicated police officer at $90,000 and completion of new design guidelines at $100,000. They’re also looking to update the downtown master plan and have pledged to “cobble together” the funding to pay for it. 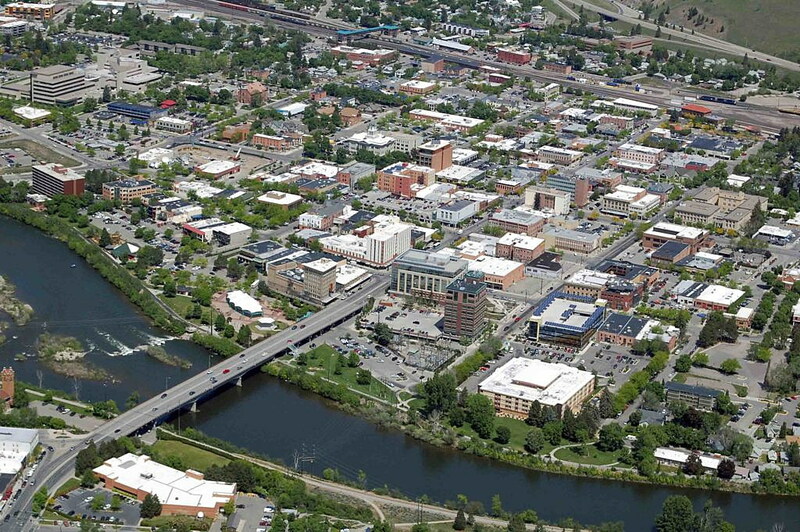 Elements guiding strategic growth in downtown Missoula were detailed in the 2009 plan, including lodging, employment anchors, retail and cultural centers.